Based in Northallerton, North Yorkshire in UK. 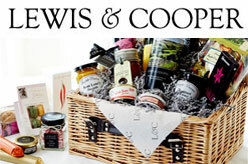 Gourmet foods, fine wines, food hampers and delicious gifts from award winning food store Lewis & Cooper, online shopping and ordering available. A fine food firm with stores in Northallerton and Yarm specialising in gourmet goodies and wine, hampers, gifts and more. Lewis & Cooper also have delightful tearooms at our Northallerton store.